Mazda is changing things up a bit for the 2019 Mazda MX-5 Miata — and we have to say, we can’t wait to get behind the wheel of it. From a more powerful powertrain to a better steering wheel, here’s a look at a few of the changes that you will find in the newest Miata. More power. For the 2019 model year, the Miata’s 2.0-liter gasoline engine will be getting a power boost. Rather than offering 155 horsepower, it will now offer 181, making it significantly more fun to drive. More colors. Mazda likes to give you plenty of choice when it comes to interior and exterior colors — and now, you will have even more options. The exact color options haven’t been released just yet, but we’re guessing they’ll be flashy and suited to this roadster. New safety options. 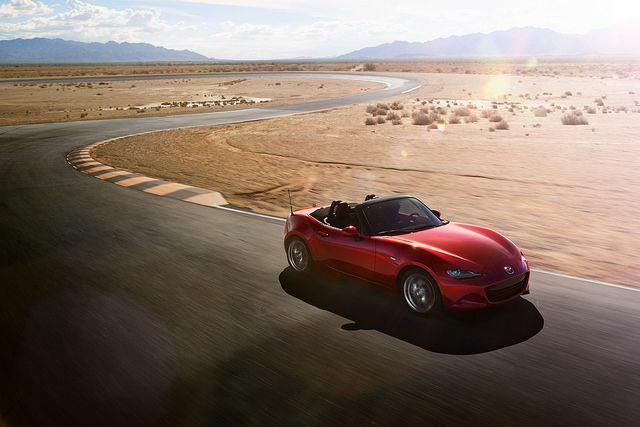 You will find that there are some changes to the safety options on the 2019 Miata. Most noticeably, the brand has added features like Smart City Brake Support, which helps drivers avoid frontal collisions while driving at slow speeds. Better steering wheel. For the first-time ever, Mazda is offering a telescoping steering wheel on the Miata. That means those drivers that are on the taller side can get even more comfortable when they’re behind the wheel of this vehicle. Test drive the 2019 MX-5 Miata when it arrives on our lot here at El Dorado Mazda later this year.